Long-Styled Sweet Cicely is one of my favorite woodland native plants. Its other common name is Aniseroot for its licorice-scented roots. Flowering in May, it's an attractive, medium sized, shade-tolerant perennial with tiny, five-parted white flowers arranged in an umbel. 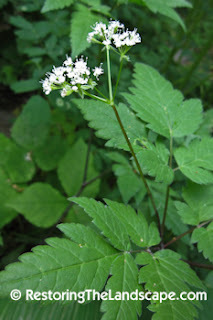 Another common Cicely is Sweet Cicely, Osmorhiza claytonii. Unlike some other spring flowering woodland natives such as Bloodroot or Rue Anemone, Cicely offers both nectar and pollen rewards to visiting insects. Cellophane Bees (Colletes spp.) visit the flowers for nectar, but in the process their hairy faces get covered with the white pollen which will aid in cross-pollination. 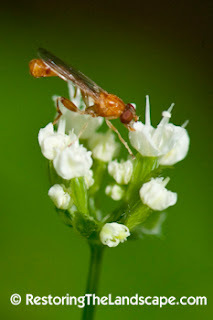 Cicely was the first plant I noticed this Syrphid Fly visiting (Sphegina spp.). These flies are common visitors to woodland natives in early spring, and they seem to have a preference for white flowers. 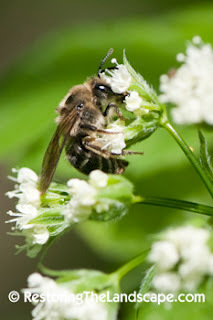 They feed on both nectar and pollen of Long-Styled Sweet Cicely. They resemble a thread-waisted wasp, with narrowed waists, and an over-sized rear femur. Larvae develop in water-logged wood as well as under wet bark. 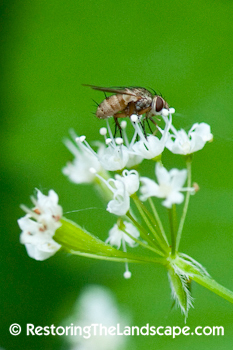 Look for these Syrphid Flies on Bishop’s Cap, Tall Meadowrue, Marsh Marigold and Goat’s Beard in the spring. 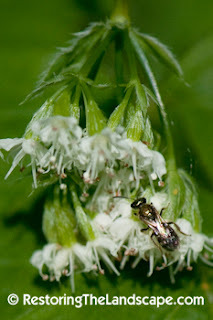 Small Sweat Bees (Lasioglossum spp.) visit Cicely flowers for both nectar and pollen. Nectar is easily accessible for short-tongued bees as the tiny flowers are shallow. Cicely also attracts beneficial insects like this Tachinid Fly, possibly a Siphona spp. Tachinid Flies lap up nectar with their sponge-like mouthparts. Adults lay eggs near or on their prey, primarily caterpillars, and the hatching larvae feed on their hosts. I have also seen some day-flying moths visiting Cicely flowers for nectar, but did not get a photo. Cicely foliage stays attractive throughout the summer months in the landscape but it does produce seeds with fine hairs that stick to animal fur and clothing. If you have a shady to part sun location with average soils, Cicely is an excellent candidate.